Airedale Springs Welcomed a New Bishop on the 20th April! Pictured – Steve Hart, Production Director, Bishop Toby Howarth and Company president Michael Parkinson OBE. The Keighley deanery is one of the five deaneries which make up the new Bradford Episcopal Area and Bishop Toby Howarth spent a week visiting hospitals, businesses and church projects in the area, and having pastoral meetings with clergy and lay leaders. Among the visits was the Airedale Springs factory at Howarth on the 20th April. 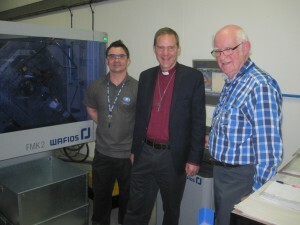 This is not the first time Airedale Springs has been visited by a Bishop, our new factory was officially open by Bishop Nick Bains in November 2012 and it was an honour to welcome his successor. 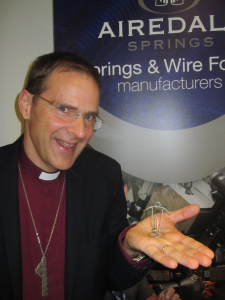 The Bishop holding a wire footballer manufactured on one of our advanced CNC wire forming machines.